Pink! 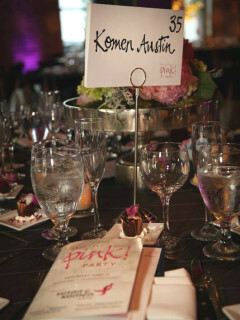 An Evening Benefiting Komen Austin is a wonderful annual party that helps raise funds and awareness for this influential organization. All guests will enjoy a "VIPink" cocktail reception, a delicious dinner, a live auction, admission to the Club Pink after-party and a raffle for the coveted Pink & Pizzazz packages featuring champagne, gift cards and Kendra Scott jewelry.